CS-21-11 specs include: hide glue construction; all solid tonewoods throughout including Madagascar rosewood back and sides, Madagascar rosewood fingerboard and bridge, Adirondack spruce top; with flamed koa binding; 1-3/4” Spanish cedar neck hand carved with modern shallow profile and vintage T-bar neck reinforcement; Authentic Series bracing circa 1940 style, including scalloped braces, tone bars and small maple bridge plate tucked under an X-brace set in the rear-shifted position; and unique cosmetic appointments based on vintage Style 21; silver C.F. 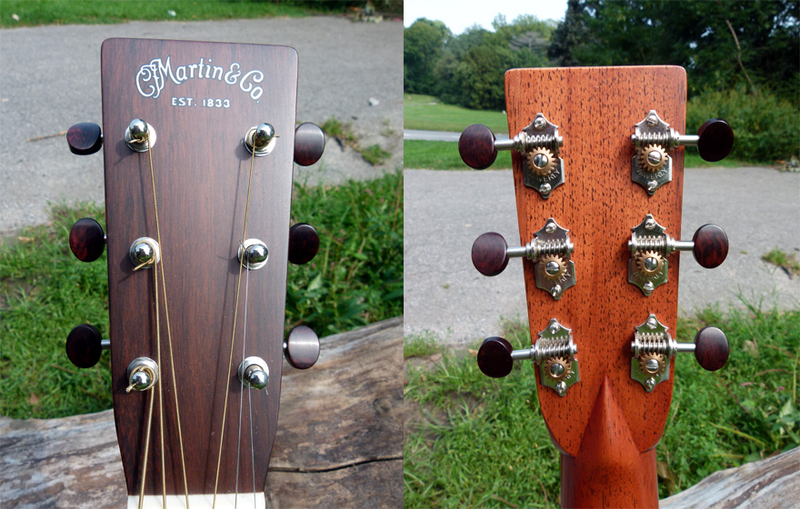 Martin headstock logo; Waverly open back tuners with snakewood buttons. Made in the Martin Custom Shop, in a unique version of vintage Style 21, and available for sale only in 2011, the CS-21-11 was the first guitar, along with the CS-35-11, in the new the CS Series that offers unique guitar designs, merging traditional and innovative features and materials. Never before had the Custom Shop offered exclusive models, rather than just building special orders to fill customer requests. While the CS-35-11 was designed as a thoroughly modern Martin, it was the CS-21-11, with its exquisite vintage vibe that captured the collective guitar player imagination, selling out in weeks a run that was expected to take the entire year to exhaust. This particular CS-21-11 was one of the first batch of seven made in 2010, prior to the NAMM show. While it has the sixth serial number, the company’s official position states that it simply means each guitar had its neck block assigned in that particular order, but it is impossible to say which guitar was actually completed first. As far as Martin is concerned, all seven “were made at the same time.” And these seven are unique, as they are even lighter in weight than all others that came after. The primary goal of Fred Greene, Vice President/General Manager of Guitars at Martin, when he designed the CS-21-11, was to make the lightest, most responsive dreadnought possible. To that end, he had them weigh their entire stash of Madagascar rosewood, piece by piece, and then selected only the lightest 10% for this model. “The guitar is very light weight. The first seven built average 4.1 pounds.” said Greene. That makes this model almost one pound lighter than typical Martin dreadnoughts, which already have a lighter build than many other modern acoustics. 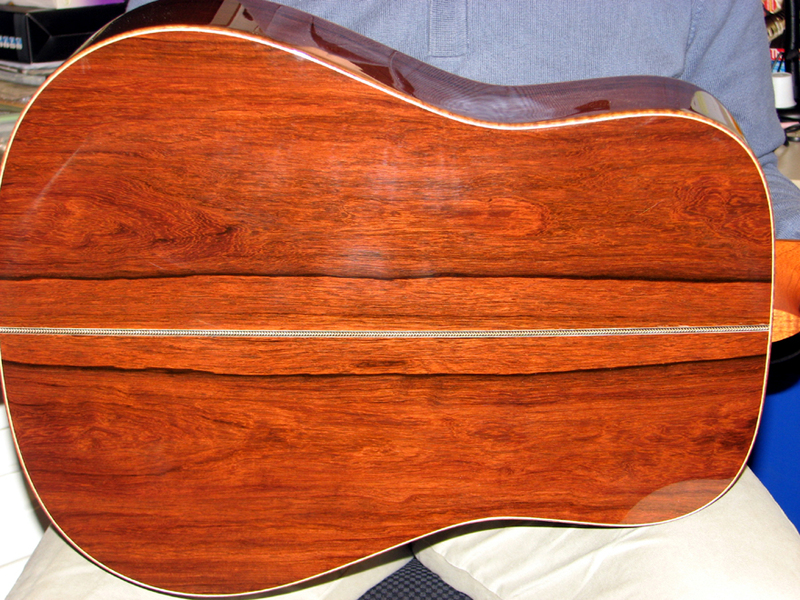 The Spanish cedar used for the neck is the same wood Martin was putting on necks in the 1800s, and it is commonly found today on the highest level of classical guitars made in Spain. To further reduce weight, each neck was carved by hand into a sleek, ultra-low profile, and they even chose tuning machines with snakewood buttons to cut the overall weight. Fred Greene was understandably proud of how well he and his team were able to combine traditional Martin craftsmanship and building techniques with progressive design features. And the CS-21-11 neck is one of the most obvious. But after the first batch of 7, which were completed prior to the NAMM show, the decision was made to use a thicker neck more like traditional Martin necks. 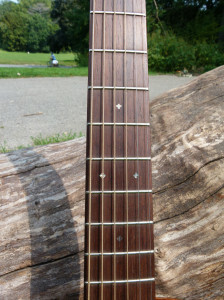 As such, this particular example has a neck profile shallower than those made afterwards, which maintains the nice, low profile all the way up to 12th fret where it meets the heel of the neck. 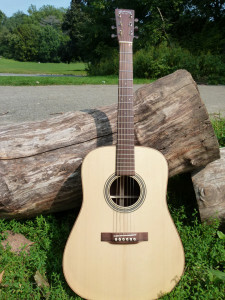 While it is truly unique, the shape can be compared favorably to the necks now appearing on the Martin Performing Artist Series, as well as typical Taylor guitars. But it retains the traditional Martin “taper,” so it is 1-3/4” at the nut and 2-1/4” at the 12th fret. That ultra-light build contributes mightily to the guitars breathtaking resonance, response, and purity of tone. It astonishes with how much resonant, living tone swells out of it with the lightest touch, and how that glow increases as chords and picking patterns sustain over time. And the response to nuanced playing and the ultimate payoff in tone only increase as the top brakes in and the guitar grows up. Madagascar rosewood has its own unique voice, which has properties of other rosewoods, while also having an almost-mahogany like ring from the unwound treble strings. But the CS-21-11 takes all that Madagascar/Adirondack ring and tone, and infuses it into a guitar that is more like a pre-war D-18 in terms of its responsiveness, cavernous open basement, and dry, woody resonance than most any modern guitar I have played. And yet, it has its own personality, which stands apart from all other Martins. The bass has wonderful definition, so the bottom notes sound warm and full, yet sculpted and firm. That is typical of the Martins made from 1939 up through the war years, as they featured scalloped braces that had the main X brace in what is now referred to as the rear-shifted position. The midrange has a lot of wood behind the pure notes, and the trebles are spider web thin but generate such succulent tone when played lightly, that it seems to quiver into existence out of the ether. Played with vigor and they cut through loud, but precise, again, more like a pre-war D-18 than other guitars. At all times it channels a pre-war Martin, and yet it is not exactly not any Martin that came before it. Or so I would have thought until just recently. I recognized very similar tonal properties in a particular and rather famous guitar right when I had returned to this review for final editing. I was listening to a 1959 recording of Merle Travis playing his long-time warhorse D-28 through a stage mic and I found it be quite similar to the recordings I made with this CS-21-11. Travis’ guitar was made at Martin in 1946, but it had a replacement neck made out of maple that was narrower and shallower than the original neck. While it would have had rear-shifted braces, they would have been “tapered” rather than scalloped like pre-war Martins (smoother, less radical carving of the braces.) I wonder if it might have been the smaller, lighter maple neck that helped give it a tone that was noticeably similar to the CS-21-11, with its light-weight neck of Spanish cedar. In any case, this very cool Martin dreadnought is familiar yet new. It has rosewood warmth in the lows and mahogany purity in the highs, and the angelic ring that one only hears from Adirondack spruce colored by the harmonic complexity of exotic rosewood from Madagascar. And it seems fitting Martin chose to make this guitar with aesthetics that harken back to the old Style 21 Martins, made to offer a rosewood guitar in a more mahogany-like package. Since the rosewood was chosen for its weight, the sets used for the CS-21-11 vary. This particular guitar has parallel black stripes on either side of the center strip, which immediately bought to mind many vintage Martins. It looks more like Brazilian than most Madagascar rosewood. And the swirls and feathering in the grain that are typical of Madagascar fits well with vintage Style 21, since Martin tended to put the more unusual or flamboyant rosewood on their 21s, while Style 28 got the more conservative, straight laced rosewood grain patterns. The spruce with its faint vintage toner has extremely tight grain, which is evenly spaced across the entire soundboard. And it has so much in the way of rippling cross grain that is looks like it is woven out of felt or raised linen. While the CS-21-11 has non-traditional features, like wooden binding of flamed Hawaiian koa wood, and a vintage Martin logo in silver rather than gold, the overall appearance remains that of Martin’s vintage Style 21. 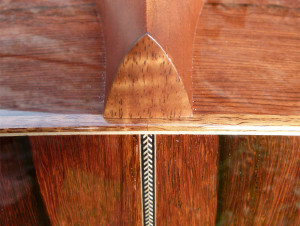 It has the herringbone rosette, back strip, and two gossamer thin lines of black wood fiber inlaid around the edge of the top, as one would see on a 00-21 of circa 1905. But it is given the classic diamond inlays at 5th, 7th, and 9th position seen on a 000-21 from the late 1930s. But it wasn’t until 1955 that Martin made a dreadnought in Style 21, and by then it had been simplified to white dots on the fretboard and no sign of anything like herringbone purfling. The D-21 was famous for having the complexity of a D-28, but the more open and airy qualities of a D-18. 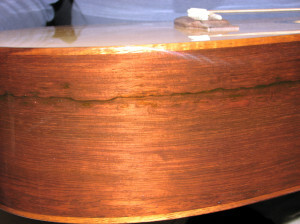 For years rumors circulated that Martin shaved their rosewood thinner to achieve this result. The real answer lies in the rosewood fingerboard and bridge, which Martin first applied to Style 21 guitars in 1947, the same year they discontinued the herringbone rosette. 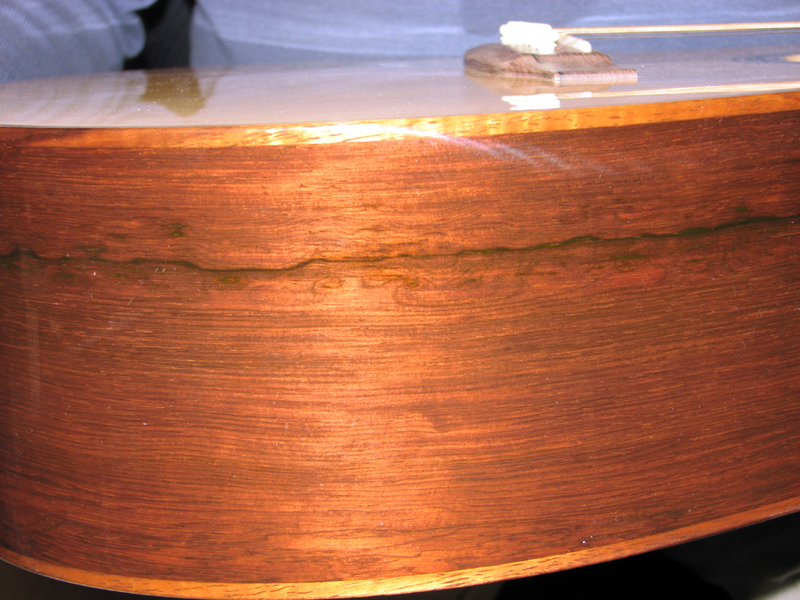 All rosewoods are less dense than the ebony used to make bridges on most Martins, and that provides a different kind of filter for the physical energy coming from the played strings, which pass through the bridge to the spruce soundboard responsible for converting it into audible sound waves. And this CS-21-11 is yet another fine example of the unique openness and clarity heard from a rosewood guitar made with a rosewood bridge. While the original D-21 had a back and sides, and fingerboard and bridge, made of Brazilian rosewood, the CS-21-11 is the first and only Martin guitar to feature a fingerboard and bridge of Madagascar rosewood, just like its back and sides. In fact, that is one reason the edition sold out so soon. The first 91 sold basically instantly and Martin only purchased enough bridges and fingerboards of this rare tonewood to make 178 guitars in total. They had no expectation that the model would be gobbled up by eager guitarists less than six weeks after its debut. Someone recently suggested the number may have been chosen because 2011 was Martin 178th year in business, but I have no inside information as to whether or not that is true, or simply a coincidence. And the Madagascar rosewood used for this particular fingerboard is lovely, with a dusty watercolor look to it, and the bridge has a black grain stripe running across it that ties in nicely with the duel stripes on the back. It is the only CS-21-11 I know of that has such a cool looking bridge. Martin brought back certain features from the 1930s and 1940s when they started building their Authentic Series guitars. These included bracing identical to the pre-war Martins, matched to smaller bridge plates. Both the bridge plate and the short braces called tone bars are “tucked” under the main X-brace to promote direct vibration transference from the plate, to the X-brace, to the entire top. The technique of tucking was abandoned after the Second World War, as being too labor intensive, as it requires the X-brace struts to have channels carved into their underside to accommodate the plate and side braces. The CS-21-11 is the ONLY Martin outside of the Authentic Series to get Authentic Series bracing. 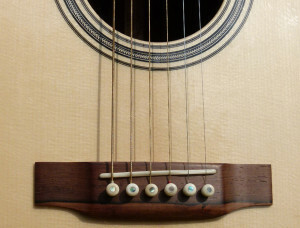 And it is one of a very small number of Martin models that have the rear-shifted bracing used at Martin from 1939 to 1944, which has the X-brace farther from the sound hole than the modern position. The D-28 Authentic 1941 and D-18 Authentic 1939 are the only other Martins made today that has both Authentic Series bracing with a rear-shifted X-brace. The CS-21-11 also has the metal T-bar neck reinforcement, just like the D-18 Authentics and D-28 Authentics. And it has an Adirondack spruce top that has been sanded to pre-war thickness, also a feature otherwise exclusive to the Authentic Series. For players who cannot handle those big V necks on vintage Martins, the CS-21-11 offered a unique opportunity to have that ultralight, ultra-responsive vintage Martin vibe with a sleek, modern neck. In addition, the entire construction uses hot hide glue, which requires considerable preparation and requirements compared to synthetic glue. Tests have shown that traditional hide glue does make a difference in how alive and resonant a guitar is in terms of response and tone. Martin stopped using hide glue in 1966, and only brought it back for the Authentics. It is now a custom option, adding some $1,500 to the retail price of a guitar. But given the price put on a CS-21-11, it is basically thrown in for free, as is the exclusive Custom Shop hard shell case, with black faux hide exterior, and the black felt guitar “shroud” inside. Both of which are embroidered with white thread, saying “C.F. Martin & Co. est. 1833,” and “Custom Shop” in fancy script. One of the most amazing aspects of the CS-21-11 and all of the Custom Shop series guitars is the absurdly reasonable pricing. As the only Martin guitar outside the Authentic Series with the Authentic Series construction and bracing, the original list price of $6,499 was more than $1,000 below the least expensive rosewood Authentic model. Authentic Series build and bracing is not offered as a custom option, but even without that throw in, someone ordering the same woods, neck, T-bar, hide glue, appointments, etc. as a one-off custom order would end up with a price tag ridiculously higher than the cost of a CS-21-11. Fred Greene and his team of highly skilled craftspeople have continued to create annual limited editions in their Custom Shop series. But none offer quite the same vintage-heavy features in such a light-of-weight, ultra-resonant guitar as this one.